The Volkswagen Golf SportWagen is a cut above the rest when it comes to design features. The engineers at Volkswagen wanted to create a hatchback for people who sometimes need just a little more space for their gear. Let’s take a look at what they did. Children's car seats make kids safer while riding in automobiles, but only if properly installed. Short for Lower Anchors and Tethers for Children, the LATCH system assists parents with car seat installation. The Volkswagen Golf SportWagen is as sporty as its name suggests. This hatchback is a versatile car that can do just about anything. The SportWagen's clever design makes it a great fit for any driver, whether they're interested in moving people or things. The SportWagen makes a great cross between a traditional car and an SUV. It has plenty of cargo space. The rear seats fold down for even more storage. However, this vehicle is still low to the ground, and it handles more like a car than like a truck. The Volkswagen Atlas is a popular midsize family SUV that also offers a powerful engine capable of towing heavy loads. Pack the spacious cargo bay with all of your gear and still have plenty of power left over to tow along a trailer loaded with ATVs or jet skis for a weekend of fun. Tow up to 5,000 pounds with the Atlas's 2.0-liter turbo engine with 235 horsepower and 258 pound-feet of torque. The Atlas also offers a 3.6-liter V6 engine with 276 horsepower and 266 pound-feet of torque. 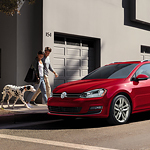 An industry leader for decades, Volkswagen leads the market of popular compact cars with its Golf, a four-door design that provides a roomy interior and plenty of power under the hood for drivers who need to pull into traffic quickly and enjoy peppy acceleration on the highway. The Golf's turbocharged engine packs 147 horsepower and 184 pound-feet of torque into its tidy frame. The eight-speed transmission performs well on its own, but drivers can take greater control over their ride by switching to either Tiptronic or Sport mode to tailor engine performance to the demands of the road. The Volkswagen Atlas is a high-tech vehicle that can keep you safe and alert. This popular mid-sized family SUV is available to drivers at Sheehy Volkswagen of Springfield. It's available with an innovative Front Assist system that acts as a second pair of eyes. Here at Sheehy Volkswagen of Springfield, we want everyone to stay safe in the event that they are ever in an auto accident. The fact remains that most of us probably will be in an auto accident at some point in our lives. When this happens it is important to remain calm and go through certain procedures to ensure that you get back home safely. Immediately after the accident you should check yourself and your passengers to make sure everyone is physically okay. You should also check on anyone else involved in the accident as well. Roads aren’t just for cars and trucks. Bicycles often share roadways, which means you need to pay extra attention to who's sharing your traveling spaces and do your part to keep things safe. Three feet is a good amount of space to leave when passing cyclists, but check your state law for local requirements. Sometimes the road doesn't allow that much extra space, so in those cases, cyclists can use the entire lane. Explore the unbeaten path with confidence in the 2018 Volkswagen Tiguan. This popular compact SUV is available with two distinct off-road driving modes to help you stay stable and safe in any condition. The first mode is the standard off-road mode. It can automatically adjust power between the front and rear wheels to provide enhanced traction. It can also initiate active features like Hill Descent Control to help you maintain a steady speed as you're going down a decline. The second mode if off-road custom. This mode gives you complete control in how your SUV performs. Volkswagen has contributed plenty of popular models to the car market over the years. The Passat heads its mid-size sedan lineup, popular for its sleek exterior design and enhanced performance features. The standard Passat offers drivers a 2-liter, 174-horsepower engine, or they can upgrade to a 3.6-liter, 280-horsepower V6 engine. The standard engine delivers 25 mpg around town and 36 mpg on the highway. The V6 offers 19 mpg in city driving and 28 mpg at highway speeds.